When you go to the store to buy charcoal briquettes for grilling, do you give it much thought, or just grab what’s on sale? If so, are you really getting a quality product or a bargain? All men are created equal, so we are told. Spoiler alert: All briquettes are not. You really do get what you pay for. This article is all about the best charcoal briquettes, what makes them good, and how you can filter through the many brands available to find them. Beginning with a brief explanation of what charcoal briquettes are and how they’re made, we’ll also separate the wheat from the chaff, laying out what makes one brand better than another. Moving on, we’ll discuss different types of briquettes and share the latest advances in briquette technology. Finally, we’ll wrap up with what are, in our opinion, a roundup and mini-reviews of the lucky 7 best briquettes available on the market today. Maybe you think you already know everything about these small, black, incendiary bricks? (How metal is that?) Well, we’re about to light a fire under your assumptions. What are Charcoal Briquettes? How are They Made? Is it Briquette or Briquet? What Makes a Good Charcoal Briquette? How Long do Briquettes Burn? What Temperature do Briquettes Burn at? 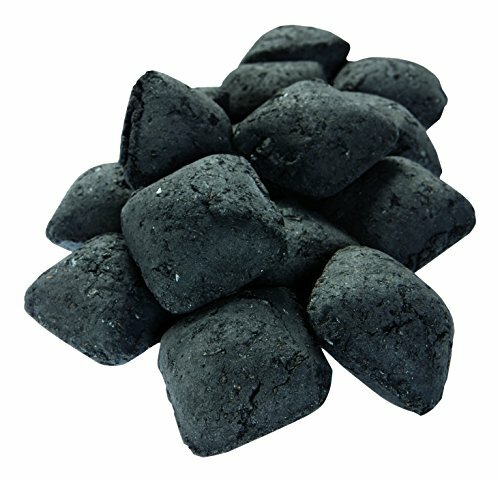 A charcoal briquette is a manufactured product composed of mostly charcoal, which is carbon created by burning wood in a low-oxygen environment. Basically, every component of the wood burns, melts or vaporizes until only the carbon remains. To make a briquette, bits of this carbon and ‘other stuff’ is mixed into a thick paste and fed into rolling molds that compress the mixture to form little bricks and give them their distinctive shape. That varies between manufacturers, but typical ingredients include sawdust or woodchips, coal, peat, borax, limestone, sodium nitrate, and starch. These additives perform a variety of functions from binding everything together (kind of like the Force) to helping the whole mess burn. The new briquettes go into a drying tunnel, dried to about 5% moisture content, and then bagged. This “How It’s Made” video shows the entire process inside a factory. Charcoal briquettes burn consistently due to their uniformity, and this makes them an excellent choice for most grilling and smoking applications. However, if you’re looking for intense heat, they don’t burn as hot as lump charcoal. The downside of using them is they produce more ash than lumpwood charcoal, up to 10% of its original weight. If you have a narrow grill like a Kamado Joe or Big Green Egg, the ash builds up quickly and could clog the lower fire grate. Because they often use waste from sawmills and the like, you could look at briquettes as an eco-friendly solution, using up waste materials that might otherwise end up in a landfill. From the manufacturer’s standpoint, they are more economical, too, since they’re not pure carbon. Some briquettes also use flammable chemicals to help them light more readily. We’re not a big fan of this practice, but we’ll get into that later. You’ll see both spellings as you browse the internet, and manufacturers use both, too. Which is correct? At any rate, either spelling is acceptable, though, truthfully, if it were a French word, briquet would be pronounced brick-ay. Though they all look similar, as with everything, some briquettes are better than others. A good charcoal briquette will give you a good burn time and leave not too much ash. Why is that important? Ash is nasty stuff that clogs vents, hardens when it’s moist, and can be messy to get rid off. It can also smother your fire, which is the exact opposite of what we want to happen. Having said that, all briquettes leave more ash than lump charcoal – and we’ll discuss lump in a little bit. With briquettes, the closer you can get to 100% charcoal, the better they are. Unfortunately, 100% charcoal won’t stick together to make a briquette. It needs a binder, like corn or tapioca starch. Some manufacturers add too many inert ingredients just to add weight. Briquettes can have up to 10% ash that contains limestone, sand, clay and other substances. It can be challenging to know who makes briquettes with the fewest additives. Most manufacturers won’t give up their recipes, leaving the detective work to curious back-yard chefs who experiment and post their results. I’ll provide all the information I found when we get to the brand review section below. If you want all the details of the manufacturing process, this article explains in detail the process of the charcoal briquette manufacturing process. A good briquette should also hold its shape in the bag and your firebox. One of the beauties of them is they are easy to stack and arrange for controlled burns, multi-zone cooking, and so on. A briquette that crumbles into bits and pieces is pretty much useless. The job of a briquette is a pretty simple one: it just needs to catch fire. Clearly, then, a briquette that ignites easily will be one you enjoying using. But, why does it light easily? We’ll talk more about that in the next section. We’ve handpicked 7 of the best charcoal briquettes on the market for your consideration. Here are some of the factors we looked at, and that you should consider if you choose to strike out on your own. Better quality briquettes will have “100% hardwood” on the label. That doesn’t mean they are 100% charcoal. It just means the charcoal doesn’t come from saw dust, pallets, and other scrap wood. It won’t be mixed with anthracite coal to reduce cost like cheaper briquettes. The number one thing to avoid is self-lighting briquettes. Sprayed with mineral spirits or other volatile petroleum products, they smell like jet fuel, and the chemical flavor can permeate your food when you cook with them. They light with one match, but the smell never goes away while you’re cooking. Though most people think ‘charcoal is charcoal,’ briquettes and lump are very different. In a nutshell, lump charcoal is pure charcoal without any additives. They make lump charcoal by burning wood without oxygen, driving off all the moisture and volatile gases, so all that’s left is pure carbon in the shape of the wood pieces it once was. No two bags contain the same sized pieces. It’s more expensive, burns hotter and faster than briquettes, but is more ‘pure’, natural, and has absolutely no additives whatsoever. Using lump charcoal takes more experience and close supervision to manage your grill or smoker. Briquettes, as we’ve already covered, are machine-formed from charcoal and an assortment of additives and by-products. They are uniform in weight and size. Unlike lump, they burn consistently, usually for longer, and give you easier temperature control. If you’d like to learn more, take a few minutes to check out our article on the differences between these fuels and their use in our article: Lump Charcoal vs. Briquettes. We’re starting to see this term more often than ever before. Why? Because it’s a buzz-term in the marketing world, that’s why. It makes people feel better about what they’re lighting on fire. There’s not much guidance from the government agencies regarding the claim “All-Natural.” The term refers to the difference between natural vs. man-made or synthetic ingredients. Most agencies like the FTC and FDA focus on cosmetic labeling and ingredients when they refer to all-natural claims, but don’t seem to say much of anything on charcoal. An all-natural briquette doesn’t have any synthetic materials or weird chemicals inside. Typically, they’re made of carbon, wood, and coal, maybe some starch and borax. All of these are naturally occurring ingredients, not made in a lab. Many brands were already ‘all-natural’ but weren’t calling it out because it wasn’t deemed necessary. Well, now it is, apparently. We are totally in favor of eco-friendly products and not putting chemicals into our food and our bodies. An all-natural briquette is undoubtedly a good thing. Having said that, this is a bit of a marketing ploy. It’s not deceptive at all, but it’s kind of overselling the point in our opinion. The briquette was invented in 1897, and, for much of its existence, it hasn’t changed a lot. Lately, though, we’re seeing some new options; some are on the market already, and some, perhaps, are yet to come. One exciting product we can get behind is coconut charcoal. We’ve all heard of activated charcoal. You see it used in water or air filters. Did you know that most activated charcoal comes from coconut husks? Until recently, most people never thought about using coconut charcoal to cook steaks. As it turns out, old coconuts are very hard and woody and can be turned into excellent charcoal briquettes. Made in Asian countries, you’ll usually find it in hexagonal shaped extrusions with a hole in the middle. Coconut shell briquettes utilize an otherwise useless resource leftover after the meat and water are harvested. It’s touted as eco-friendly and is sustainable, too. Basically, they’re just regular briquettes but with the addition of mineral carbon and sand. Apparently, these additives help them burn hotter and longer, and they’re huge sellers down under. From Africa, we hear reports that an entrepreneur is making a crap-load of briquettes out of, well, crap. Solving two problems with number two, his company rents toilets to impoverished families making their lives more sanitary, and then collects the contents and turns them into briquettes for heating and cooking. We find it very hard to imagine this catching on in the Western world, but it is an ingenious solution. Right. Now back to our garden-variety productss. This will vary from brand to brand, and type to type. While some manufacturers claim extended burn times of 3 hours or more, on average, typical briquettes will burn from 1.0 to 2 hours. It depends on the ingredients used, the amount and type of fillers, as well as the temperature you’re running your grill or smoker at. Personally, for an individual briquette, or a pile all lit and burning together, estimating a 2 hour burn is always a good ball park figure. Many brands are around this figure. However, if you set up a charcoal snake, or minion method for low n slow smoking, you can quite easily get 12 hours or more burn time from a full load of fuel in a medium to large grill or smoker. So don’t be afraid of what sounds like a short burn time, that’s plenty of time for your typical grilling session! How hot briquettes burn has a lot to do with how much oxygen they have and how concentrated they are. For example, by using the “afterburner method” -cooking directly on a charcoal chimney starter- you can hit 1,000F. Alternatively, you can set your charcoal to one side of your grill and cook on the opposite side at more like 250F. On average, expect to average around 500F or higher without any great trouble – just flip the lid and let the oxygen do its thing. Perhaps the straight answer is YOU determine how hot your briquettes burn! Now that you know what to look for in a briquette, we’ve gone ahead and done some of the legwork for you in finding the best. There are many, many brands on the market. I chose the ones below because they are popular, well rated, high quality and they should be easy to buy locally or online. You can find other small companies who make excellent quality briquettes, but they are either too local or have an inconsistent supply. So, below are reviews and specs of what are, in our opinion, 7 of the best charcoal briquettes available on the market. Which one will find a home with you? Royal Oak isn’t a household name like some other brands we reviewed, but it consistently ranks at or near the top of briquette reviews. This is a superior briquette made with only hardwood charcoal. It burns hotter than most other brands, so get ready to sear like a boss. It burns longer, too – like a lot longer. That’s awesome if you’re smoking, and it helps offset the somewhat higher than average price. With an enhanced ridge around the middle of each briquette, you’ll find lighting up to be a breeze. It’s like trying to start a fire with kindling instead of logs. They’ll get up to temperature quickly, too, meaning less time waiting and more time cooking. There’s no coal in this product, and very little of anything else, either, except American hardwood charcoal. That means you get a “clean” smoke that won’t make your food taste like chemicals. It’s a nice, natural smoke flavor, and not at all overpowering. 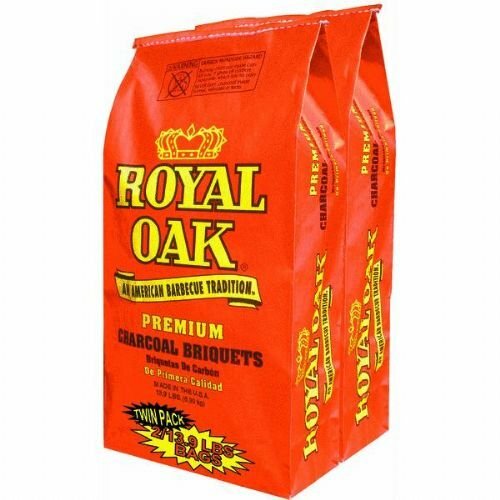 They may look a little unusual, but, without a doubt, Royal Oak briquettes are a premium product, and we highly recommend them. Does it cost a bit more? Sure, but it’s well worth the investment for a better-than-your-average charcoal grilling experience. 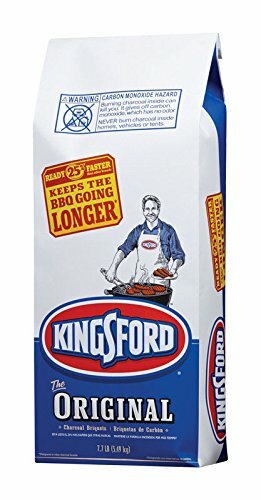 A company began by Henry Ford looking for some way to make money off the lumber scraps from Model T production, Kingsford is the #1 best-selling brand of charcoal in North America. They make several different formulations, but the Original is their bread-and-butter. There’s a good chance you’ve been to a barbecue where this was the charcoal of choice. Unlike ‘premium’ brands, there are certainly cost-reducing fillers in Kingsford Original, but they’re all-natural. There’s no lighter fluid or other chemicals impregnated in the briquettes, and everything is sourced within North America. One premium feature you do get is the twin grooves on the two faces of each briquette. Not only do they make them easier to light by providing more thin edges, but they also improve airflow between the briquettes when they’re stacked. This means they’ll burn more evenly (fewer hot/cold spots) and that’s better for cooking. They won’t burn as hot or as long as some premium offerings, but they’ll be more than sufficient for your typical backyard or campground barbecue. There’s a reason Kingsford is number 1 – it’s a good product at a good price. Kingsford Original does the job asked of it, and it does it well. When you see the name Stubb’s, you probably think about tasty sauces and rubs. But, they also lend their name to some of the best-rated briquettes going. What’s so great about it? For starters, it burns hotter than pretty much anything else out there, so you’ll be searing steaks with authority. Plus, they burn for a long time, well above the average among competitors. Amazingly, they also leave far less ash behind than almost any other brand. Inside each briquette, you’ll find next to nothing but pure hardwood charcoal. There’s no coal, no sawdust, no limestone, and no chemicals. The only additive is a vegetable-based binder to hold it all together. That’s part of why they perform so well, but it’s also why they cost more than briquettes that contain filler. For a pure, clean smoke with real wood flavor, it’s very tough to beat Stubb’s, and many people swear by it. Availability is sometimes an issue so if you want some, grab a few bags. We highly recommend this product for the discerning charcoal griller. 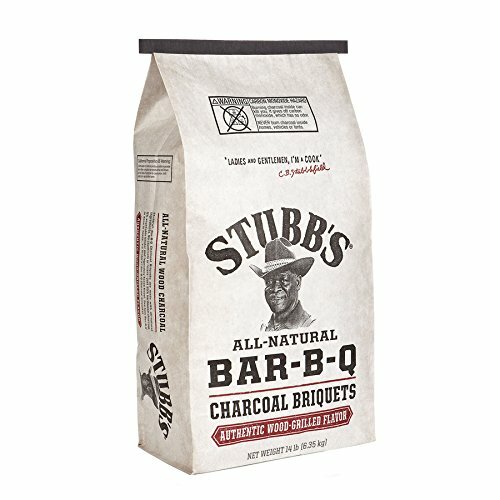 Try Stubb’s for yourself, and we’re sure you’ll see why it’s a perpetual contender for the best briquettes you can buy. We love how pure it is and how well it burns. You won’t be disappointed! You’ll find few brands more recognized in the barbecue world than Weber. However, they’re better known for their grills than for their briquettes. We’re here to tell you that their charcoal is also good stuff. Like other premium brands, there are no chemical additives. The bulk of each briquette is all-natural hardwood charcoal. Weber touts, “Environmentally conscious use of hardwood and harvesting methods,” but doesn’t go into detail. We like Weber, so we’ll assume the best. The individual briquettes are noticeably larger than most others we looked at so you won’t need as many each time you cook. Then again, you won’t get as many in a bag so it kind of evens out. Also, they burn very hot and for a long time. By some accounts, they are among the longest burning brands you can buy. One point of difference is the packaging. They use a resealable, weather-resistant plastic bag for more extended storage eliminating water seeping into the briquettes. A couple of users have commented the bag was difficult to pour from, but we don’t mind the trade-off, knowing our coals are protected from moisture that could ruin. These are a no-nonsense product from a company that knows grilling inside and out. They work as advertised, plus you get the resealable, weather-proof bag as a bonus. This is money well spent. The name and the cool packaging would make this charcoal worth buying even if it was mediocre. But, it’s even better knowing that it’s excellent stuff – plus, it helps out a worthy charity. Created by American start-up Fire and Flavor, it’s made from sustainably sourced oak and hickory with no artificial enhancements. You’ll get clean smoke, no acrid after taste, and less ash. There is, however, a physical enhancement. Each briquette has an extended “burn ridge” extending around the middle for easier lighting. Not only do the edges light more quickly, but they also create channels for better airflow, and air is essential for fire. This is a major bonus for anyone who hasn’t invested in a chimney starter or Looftlighter. In addition to doing good for your grill, your purchase does good for the world, too. A portion of the proceeds from each bag goes to the John Wayne Cancer Foundation, an organization dedicated to spreading awareness of the dangers of skin cancer and funding cancer research. That’s a pretty nice perk. Oh, and on top of everything, the bag is emblazoned with a pretty cool image of the Duke himself. It’s not often you get the chance to do something for yourself that benefits others at the same time. This is really good, clean-burning charcoal you’ll love cooking with. Knowing you’re aiding cancer research with each cookout is the dry rub on the steak. Generally speaking, cooking with charcoal adds some smoky flavor to your food. Nothing you could put a finger on and say, “Hey, that’s such-and-such wood!” It just has that authentic, char-grilled taste. For distinct flavors, you need to add flavor wood, as chips or chunks. Or do you?? 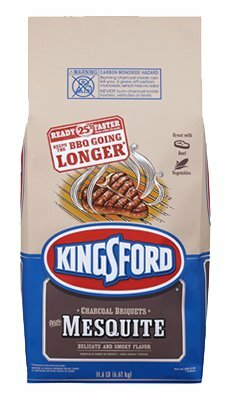 Kingsford has a line of briquettes infused with flavor wood to release a more delicious smoke. There’s real mesquite inside each briquette, along with the usual hardwood charcoal and assorted, all-natural fillers and binders. That being the case, we expect similar performance to the Original version – good overall temperatures and burn time, and ready to cook in a hurry. As with all Kingsford charcoal briquettes, the mesquite version is made with two grooves on each side. These allow for easier lighting and increased airflow through your snake, pyramid, or other configuration of briquettes. This product is excellent for anyone wanting to add a delicate mesquite flavor to his or her food for a charcoal grilling taste experience that’s out of the ordinary. It’s not a substitute for real smoking, but it’s a heck of a nice option and so easy to do. Adding flavor wood to briquettes is a great idea for those who love the taste. This is a terrific innovation, and we encourage you to give the mesquite a try, especially if you’re into steaks and ribs. Instead of the usual North American hardwood charcoal, these briquettes are made from coconut shell charcoal. Cashing in on the boom in coconut oil, coconut milk, and coconut water, Coshell saw money in the discarded shells. The hard shell is practically wood, so it only makes sense to burn it down into charcoal. Remarkably, this all-natural charcoal (it’s bound with tapioca, and there are no other additives) burns hotter and longer than just about anything on the market. It burns very clean, too, and we can well imagine it’s better for the environment. The only real drawback we can determine is in the smoke itself. Despite the high temperatures, the composition of the shell apparently prevents it from generating a lot of smoke. This means you won’t get a lot of that smoky flavor some people want when they grill. If you prefer a subtle taste of smoke, then this will be music to your ears. And, if you’re into plants, you’ll love this part: according to the manufacturer, the ashes can be used as a 100% natural fertilizer in your garden. What a perfect way to close the loop with this eco-friendly product. This may just be the tip of an alternative-source charcoal iceberg heading our way. 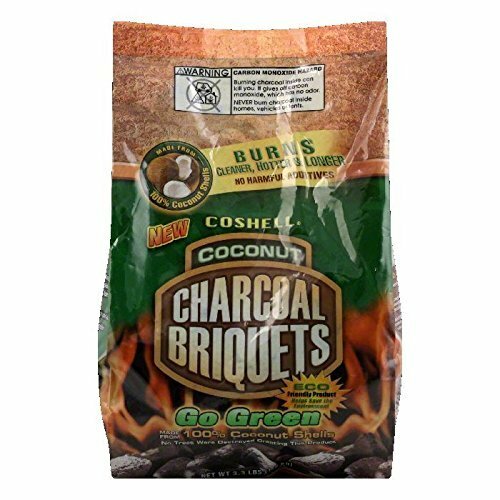 Coshell Charcoal Coconut Briquettes is not your father’s charcoal. It is, however, an awesome way to use a fuel source that would have ended up in the waste cycle. For hot, long-lasting coals, this is an excellent choice. We hope this buyers guide has helped you find your new go-to briquettes, and that you have many days of happy grilling ahead of you. If you have any questions about charcoal briquettes we didn’t answer, please, do send them to us, and we’ll happily address them. We also love to hear your comments and your grill-side tales, successes and challenges alike, so drop us a comment in the section below. Thanks for checking us out today. Grill on!